ZW SERIES OIL FREE SCREW COMPRESSORS PRODUCE TOTALLY OIL-LESS AIR WITH A WATER INJECTED COMPRESSION PROCESS THAT IS COMPLETELY FREE OF ANY HYDROCARBONS. Variable Speed Driven ZW compressors offer an additional 30-35% energy savings and long life cycle to customers with variable air demand. Naturally “Green” by design, each provides high quality air, low dB(A) noise levels, efficient use of energy, and no oil discharge to the environment. Even service costs are very low with no oil filters, oil separators or oil to dispose. ZW’s 4-Stage Water Purification System with reverse osmosis membrane & water pump is furnished standard to remove all contaminants to provide clean, flat water to prevent contamination buildup on the internal components. Total water filtration, cleaning and automatic flushing ensure high air quality and long component life cycles. Our advanced alphanumeric display Controller manages the system and monitors temperatures and pressures to protect your investment and ensure you extract the maximum performance and energy efficiency from every kilowatt you use. When your application requires clean, high quality air count on the ZW Series for truly oil-less air. ZW Compressors are environmentally safe with high efficiency and are an extension of our current offering of Oil Less piston compressors. 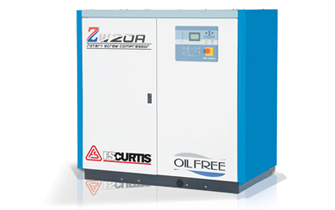 FS-Curtis oil free compressors serve the majority of your compressed air needs. SYSTEM CONTAINS NO OIL, UNLIKE DRY SCREW COMPRESSORS. WATER COOLS, SEALS AND LUBRICATES THE COMPRESSOR. CERAMIC, WATER LUBRICATED BEARINGS FOR LONG LIFE AND HIGH RELIABILITY. WATER SEALS THE CLEARANCES EFFECTIVELY FOR LOW ENERGY CONSUMPTION (UP TO 15% LESS THAN DRY SCREW) AND NO AIR FLOW IS WASTED TO SEAL VENT. AS THE WATER ABSORBS THE HEAT FROM THE AIR DURING COMPRESSION, THE COMPRESSOR ACHIEVES NEARLY IDEAL ISOTHERMAL COMPRESSION FOR OPTIMAL EFFICIENCY. DIRECT DRIVE OF THE AIR END IMPROVES THE EFFICIENCY AND LOW ENERGY CONSUMPTION. ADVANCED PROPRIETARY PROFILE IS MACHINED TO HIGH PRECISION (VS. MOLD-CASTED POLYMER ROTORS) FOR HIGH EFFICIENCY AND LOW ENERGY CONSUMPTION. SAVE AN ADDITIONAL 30% TO 35% OF ENERGY COST WITH OPTIONAL VARIABLE SPEED DRIVEN ZWV. OIL-LESS DESIGN REQUIRES NO OIL CHANGES, OIL FILTERS, OIL SEPARATOR ELEMENT CHANGES, OR COSTLY DISPOSALS OF OIL FILTERS AND THE ZW AIR END DOES NOT REQUIRE HIGH COST REBUILDS LIKE DRY SCREWS. OIL LEAKS OR DISCHARGES INTO THE ENVIRONMENT REQUIRING COSTLY REPAIRS ARE AVOIDED, AND NO NEED FOR HIGH MAINTENANCE OIL-WATER SEPARATION SYSTEM. LESS DOWN TIME DUE TO EASY AND FAST SERVICE. LOWER LIFE CYCLE COST (LLC) WITH VARIABLE SPEED DRIVEN ZWC COMPRESSORS. LOW OPERATING SPEED (3,550 MAX) VS. DRY SCREW OIL FREE COMPRESSORS WHICH CAN RUN UP TO 40,000 RPM. THE 3,550 MAX RPM MEANS LOW BEARING LOADS FOR LONG BEARING LIFE, INCREASING RELIABILITY AND DECREASING THE RISK OF DOWN TIME. LOW OPERATING TEMPERATURE DOES NOT SUBJECT THE UNIT TO HIGH HEAT LOADS (VS. 500-600 F FOR DRY TWO-STAGE OIL FREE UNITS). SIMPLE CONSTRUCTION WITH CERAMIC BEARINGS GIVES YOU HIGH RELIABILITY AND LESS RISK OF DOWN TIME. TOTALLY OIL-LESS, COOL AND CONTAMINANT FREE AIR. WATER IS EASY TO SEPARATE AND REMOVE, UNLIKE OIL, WHICH IS MORE DIFFICULT TO REMOVE. WATER INJECTED TO THE UNIT FILTERED IN SEVERAL PHASES AND AUTOMATICALLY REPLACES EVERY 100 HOURS TO ENSURE CLEANLINESS. STAINLESS STEEL AND BRONZE ALLOY NON-CORRODING COMPONENTS WITH NO TEFLON OR OTHER COATING MATERIAL TO WEAR AND CONTAMINATE THE AIR STREAM.